The second Silverberg/Haber anthology, and as with last year’s issue, the first to hit the shelves. Several of the stories below were previously reviewed on Best SF, and in those cases I have reprinted my comments at the time. In an article on LocusMag (click here), Scottish writer/IT journalist Charles Stross was listed in Nick Gevers’ Top 10 Contemporary Short SF and Fantasy Writers, citing Stross as “appears to have cornered the market on density of concept”, and this story is no exception. Manfred Macx finds himself in a very disturbing position: he is mugged, and his glasses and belt are stolen, leaving him … unconnected. ‘..is this what consciousness used to be like?’ he ponders, as the mugger who is wearing his kit is struggling with information overload. A struggle over the Equal Rights Act is taking place, legislation which ‘is based on a cult of individuality that takes no account of the true complexity of postmodernism’. Stross brings together characters from previous stories (including the lobsters), and new players(!). But to tell more would be to spoil your enjoyment. Slipped in between the story, the future history of IT and AI is scoped on a broad canvas, with just enough detail to intrigue. It is almost cyber-impressionism – Stross gives shapes and images and colours, but leaves out the unecessary fine detail. 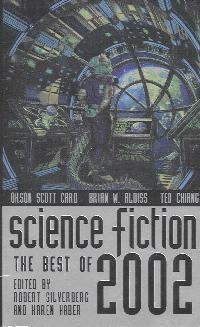 Here’s a tip: if you like hard SF, and you haven’t read Stross, click over to Fictionwise and buy this issue of Asimovs. Asimovs has continued with the Macx stories, and Stross, in between his blogging, is getting more words down on paper for us. Geoffrey A. Landis. The Long Chase. Half a millenia hence. The solar system has seen a war between two factions – the collective faction, in which humans which have uploaded into computers wish to co-operate to the extent of merging brains, and the faction who choose to remain individually uploaded into computers. The ‘real’ humans are lost, lost in simulations and no longer relevant. The collective faction have won, although one lone individual, an AI construct smaller than a grain of sand, is fleeing the solar system in a desperate attempt to escape and survive. However, chase is given, and in a story resonant of Larry Niven’s best, early, work we are treated to a chase which is dramatic despite taking centuries. Ted Chiang. Liking what you see. Originally in: Stories of Your Life, and others. Chiang has been producing stories at a slow rate, but of an outstandingly high quality, for a decade now. This ‘story’ was the odd one out his acclaimed anthology, as it was the one previously unpublished story in the collection. I have to admit it didn’t quite grab me. The story is essentially a series of transcripts of interviews with a number of individuals – or rather, monologues. The conceit is that in the future it is seen by some to be desirable for the condition known as calliagnosia to be widespread. Said condition makes it impossible for the person with it to respond (either negatively or positively) to the facial characteristics of others. They are therefore incapable of making a judgment based on what people simply look like, and ‘lookism’ is seen as the next step once racism and sexism has been removed from society. IMHO the conceit would have benefitted from a proper narrative, and even as it stands the interviewees come across as a fairly homogenous group, with only one individual having a particularly noticeably different manner of speaking, and then only just. Yoon Ha Lee. The Black Abacus. Warfare in quantum space, with all possible scenarios being enacted. Rachel Kilterhawk, known and feared throughout q-space as The Hawk, is a brutally successful commander. Her training-camp companion is faced, across many different quantum strands, with the task of assassinating her. …set in Priest’s long-standing ‘Dream Archipelago’ series. As with other of these stories, disorientation is a key element. The protagonist is a young man on board a ship heading for the war which is now approaching the end of its third millenia. He has no memory of his previous self, but whilst on shore leave finds memories relating to tacticle paintings beginning to surface. The story has a powerful, sensually longing tone, as the young man struggles to confront his past, with encounters with prostitutes figuring large in his life. Brian W. Aldiss. Aboard the Beatitude. A far future humanity, in which humanity retains some less positive traits – curiosity, aggression and arrogance. Aldiss pastiches some space opera/militaristic SF tropes to start with (I think that is what he is doing?!). The captain, Hungaman, who has sentenced sentient races near to the flightpath to be reduced to fuel for his ship, experiences a breakdown as reality unravels around him and the morality of what he is doing finally impacts upon him. An intriguing story, but I was left a little confused! James Morrow. The War of the Worldviews. Morrow has great fun, providing a counterpoint to the likes of the Hollywood blockbuster ‘Armageddon’. Humanity is saved from warring Martians using our planet as a battelground, by a personality-disordered group of people who use a musical approach to persuading the warring faction to make love and not war. Without the lyrical touches and sheer strangeness of the first story, this current provides an intriguing view of a female society, although the lesbian love interest was to me just a bit too by the numbers in this kind of story. However, it is one of the better stories this year. Originally in: Angles, and other stories. Card postulates multiple universes, with some having the capacity to flit between alternate timelines. The chance to move to other timelines to avoid religious strife, or national suffering, proves tempting. Against this backdrop is a story of one unscrupulous traveller across realities who finds he has been outsmarted by a group of Japanese. The story doesn’t really work that well, as it flits about rather too much, taking focus over the lead up to what would otherwise have been a dramatic conclusion. The dramatic conclusion is somewhat creaky, with the Japanase travellers, nekkid as the day they were born, overpowering armed guards through their martial arts. With the SF community having being served for two decades by the Dozois annual collection, producing an anthology with only a dozen stories is going to be challenging. The Silverberg/Haber collection makes it even more difficult as the majority of the stories are from the first half of 2002. The volume also suffers by having no editorial introduction to each story, so for a lot of readers will lose out a little from not reading the story in the context of the author’s work. I’ll reserve my judgment on this collection until I’ve read the other two annual collections.